Dr. Mahmoud is employed as an Associate Professor at The Department of Petroleum Engineering since 2016. His involvement with KFUPM began in 2008 when he assumed the role of a Research Assistant at the Department. From 2004-08 he worked as a Petroleum Engineer at Belayim Petroleum Co. in Egypt. During the period from 2001-04, he was a drilling engineer at Magawish Petroleum Co., Egypt. His Research interests are varied and covering subjects including Well simulation, enhanced oil recovery and multiphase flow in vertical and horizontal wells. He is a Ph.D. Graduate in Petroleum Engineering from the Texas A&M University 2011. 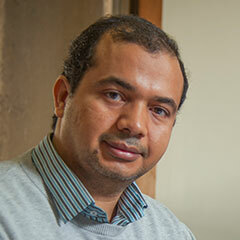 Prior to that, Mohamed undertook his M.Sc. Degree in Petroleum Engineering in Egypt in 2005. Ph.D., Petroleum Engineering, Texas A&M University, USA, 2011. M.S., Petroleum Engineering, Egypt, 2005. B.S., Petroleum Engineering, Egypt, 2001. Well stimulation, formation damage, enhanced oil recovery, drilling fluids, modeling of hole cleaning during drilling deviated and horizontal wells, and multiphase flow in vertical and horizontal wells. Mahmoud, M.A. et al. 2016. Chelating fluid for enhanced oil recovery in carbonate reservoirs and method of using the same. US 9,453,401 B2. Granted, 27 Sept. 2016. Ba Geri, B. and Mahmoud, M.A. 2016. Zero Invasion Acidic Drilling Fluid. US 20160024370 A1. Application Number: 14/337,310. Mahmoud, M.A. 2016. Non-Coiled Tubing Well Clean-up. US 9238771 B1, 14/473,113. Granted. De Wolf, C.A., Mahmoud, M.A., LePage, J., and Nasr El-Din, H.A. 2015. Environmentally friendly stimulation fluids, processes to create wormholes in carbonate reservoirs, and processes to remove wellbore damage in carbonate reservoirs. US 9150780 B2, 13/326,561. Granted. Elkatatny, S.M. and Mahmoud, M.A. 2015. New Method to Evaluate the Success of Matrix Acidizing Treatment in Maximum Reservoir Contact. US 463082, Filed. First Winner in SPE Paper Contest Award, Egyptian Section, 2001. Best Paper Award for SPE Young Professional at the ATCE 2009, New Orleans Louisiana, USA. 2009. Best Paper Award for SPE Young Professional at the ATCE 2011, Colorado, Denver, USA, 2011. Distinguished Teaching Award, KFUPM, KSA, 2016.